Yeah, but: Great light, good price, but it could still be better. The Long Version: The interesting thing about the Pelican StealthLite Recoil LED 2410PL Flashlight isn't the marketing department's 90's throwback to groovy Stealth technology. (I'm not sure exactly what a 'stealth light' would look like, but it would probably emit infrared and not be bright yellow.) Instead you should pay attention to the word "Recoil," which means that the Pelican 2410 has a bright 1-watt LED immediately behind the lens that is turned to fire backwards into the reflector. Picture a satellite dish with a bulb shining into the dish from the tip of the receiver, and imagine it beaming light back into space instead of gathering weak signals from it. What you get is a tightly focused - collimated - beam coming from a reflector that's not compromised by having the light source poking through the middle of it. 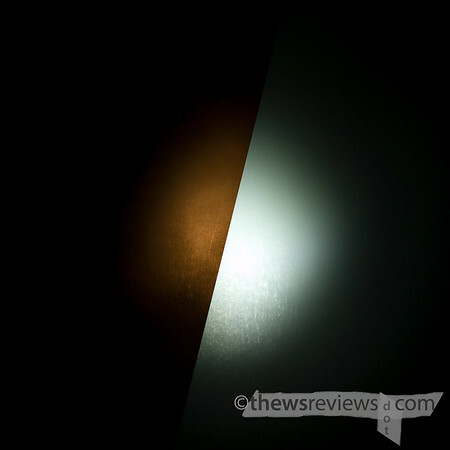 The weak yellow light in the photo-illustration above is coming from a two-double-A Mini Maglite (without the Nite Ize LED upgrade), and the strong light is from the Pelican 2410. The 'orange-peel' textured reflector design is so good that the light thrown is in a square, matching the shape of the LED. This gives the flashlight a very long throw for a light using modest AA bateries, but at the expense of very little corona to light the periphery of the beam. Pelican rates the output at 32 lumens, which I have to trust because I can't measure it myself and am not really sure what it means. 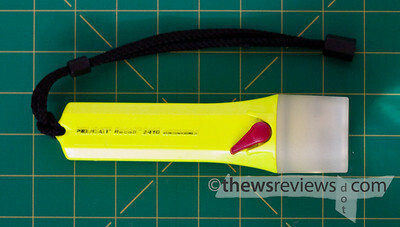 But it does sound pretty impressive, especially compared to the AA MiniMag's 5.3 lumens. The 2410 runs on four AA batteries, and the body has a flat cross-section that makes it very easy to carry in a pack or tuck in a back pocket, albeit with the head protruding. Its plastic body comes in black or yellow; the "PL" version that I have costs a few extra dollars but has the glow-in-the-dark bezel that makes the light easy to find when it's off. I highly recommend it. It's also submersible, pressure-rated to 500 feet, and resists all kinds of chemicals that I wouldn't want to have splashed on me anyway. The plastic-bodied Pelican lights are occasionally derided by those who prefer more "milspec" designs, which may be why Pelican chose the macho name for its reversed-LED design. But no matter what it's called, this light's bright yellow case, glow-in-the-dark bezel, and plastic body that can't be used as a weapon isn't going to please those who wish they were Special Ops troopers. Get over it. The Pelican Recoil 2410PL is a great functional light, so pretend you're a Fire or EMS rescue worker instead. It's a more humane mental space to be in, anyway. It's a sad truth: flashlights can be bright, small, and long-lasting, but they can't be all three at once. The Recoil 2410 is both larger and dimmer than my Pelican M6 2330 LED, at the bottom of the photo above, but the M6 also uses a pair of 3V lithium batteries that cost $15 a set and lasts about four hours before it drops below its rated 41 lumens. The hardware-store favourite AA Maglite at the top of the photo is also smaller and perhaps a little more stylish than the 2410, but is nowhere near its output. What all of these lights lack - but my little $40 Gerber has - is a regulator. This is a piece of circuitry that evens out the battery power so that the light output stays consistent for most of the battery life. It's a neat feature. If Pelican added that ability to a similar light I would consider buying it as well, and would certainly recommend it over the current design. But it's also worth noting that this light is somewhat specialized. I have many flashlights, of varying power and cost, and this is the one that throws a narrow beam of light very far and is so cheap to feed that I'll use it without worrying about its run time. (I actually use Eneloops rechargeables in it, so it costs nothing and lasts nearly forever.) It's too large for every day carry, so it's unlikely to be the light that you always have on you. It's too bright to light up a mixing board in a dark club or to read a sheet of paper while doing a presentation with an LCD projector. But it's great for "penetrating darkness," as another reviewer wrote, which is what I use it for. I bought this light with the excuse that I can use it for photography, both for being able to compose and focus for available-darkness images, and to use it for 'painting with light'. Normal people might want to keep one in the car for emergencies, or on the bedside table for prowlers. For a brighter all-purpose light, it can't beat the lights that run on multiple CR123A batteries, like my M6. General keychain and task lighting falls to either my Pelican L1 or my Gerber Infinity Ultra, which are modest lights with soft beams. But if I could only have one light that had to do everything, the Pelican 2410 is the one I would choose. The powerful light with good running time from inexpensive batteries is too good to pass up, and it's a worthwhile addition to any kit. Updated 2 July 2008: I'm my own worst enemy. 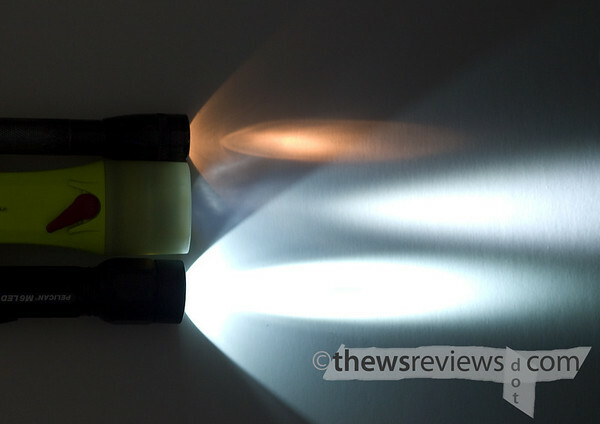 In researching this review - I do that sometimes - I found another flashlight that I want to add to my collection. It has many of the features that I love about my Peli 2410, such as the light carrying weight and nice clean light colour, but blows it (and my M6 2330 LED) away in brightness, throw, operating cost, and convenience. And I have a birthday coming up soon. So look for a couple more flashlight reviews this month: the as-yet-unidentified purchase, and my M6 before I send it to Craigslist. Updated Again 17 July 2008: My review of the new light, a Pelican 7060, can be found here. It's a light so good that it has almost retired my 2410.